Vegetable soup is one of those foods that I should love in theory, but it almost never seems to work out that way. I love vegetables. I love soup. 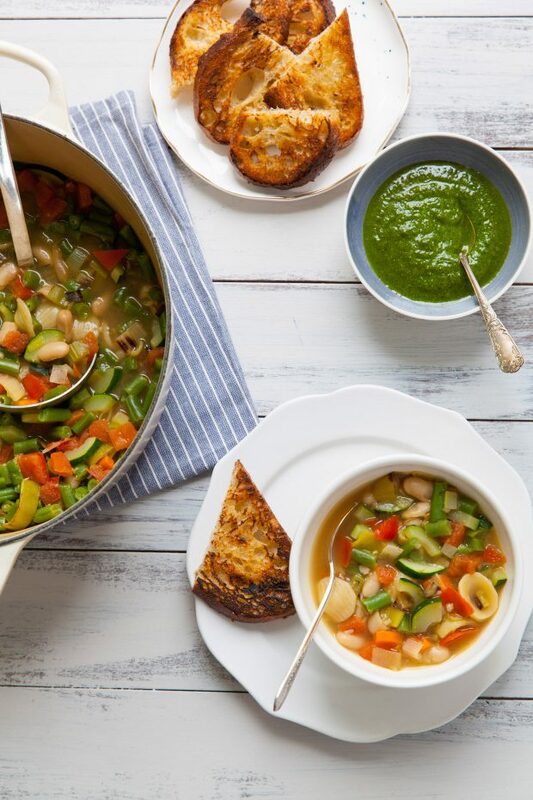 Most vegetable soup misses the mark. Sometimes it lacks flavor, or the texture is bad. Sometimes it looks unappetizing or the combination of vegetables doesn’t work well together. 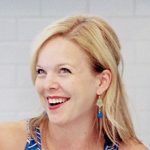 The fact that I’ve tried countless recipes over the 11 years this blog has existed and none have made it to the pages of this site is pretty telling. Finally, though, we have a winner. 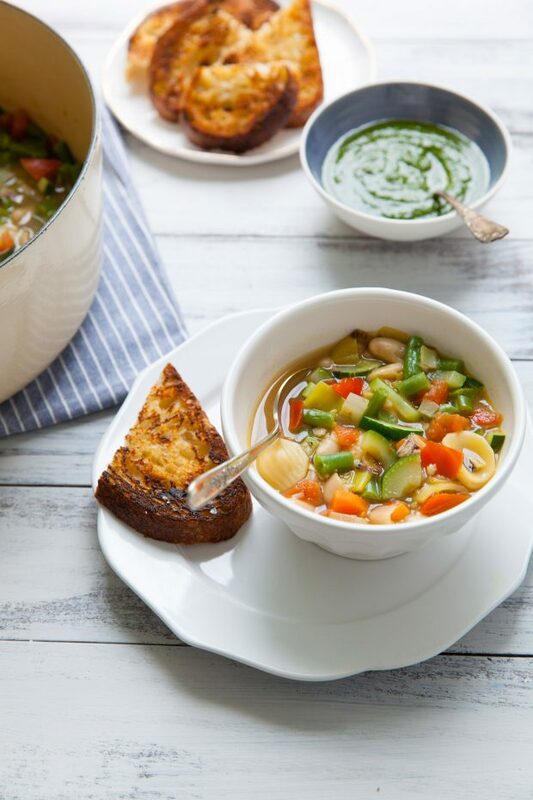 There is lots to love about this soup, and it is the crave-worthy vegetable soup I have been wanting. The combination of veggies included is perfect both as far as texture and flavor, and I love the addition of a bit of pasta and some beans to round it out. There’s no doubt that the basil pistou is the thing that takes this from good to worth repeating again and again. It adds a pop of color, a touch of richness, and a punch of flavor to bring everything together beautifully. I feel obligated to mention that the bread I served alongside this was nearly as fabulous as the soup itself and together they were a perfect pairing. It was the quickest and simplest garlic toast I’ve ever made, and I kind of want to make it all the time now. I took slices of good sourdough bread, spread generously with softened butter, and salted it well. I popped them underneath the broiler for about 1-2 minutes per side (while watching like a hawk to ensure nice browning without actually burning). Once they were finished cooking, I rubbed both sides of the bread the cut side of a halved clove of garlic. So easy and so irresistible! 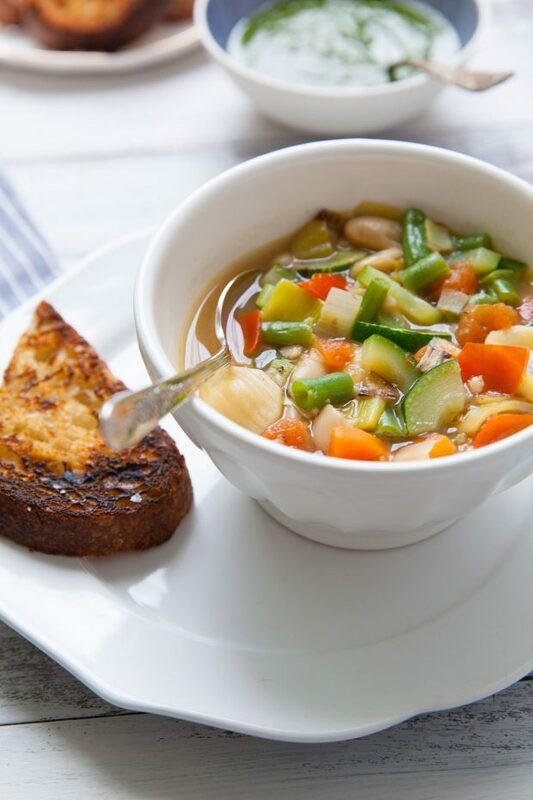 It’s the perfect simple accompaniment for this lovely soup. Enjoy! To make the pistou, combine the basil, Parmesan, olive oil, and garlic in the small bowl of a food processor or in a tall measuring cup if using an immersion blender. Process until smooth, scraping down the sides of the bowl as needed. To make the soup, heat the olive oil in a Dutch oven over medium heat. Add in the leek, celery, carrot, and ½ teaspoon of salt. Cook until the vegetables are softened, about 8-10 minutes. Stir in the garlic and red pepper flakes and cook just until fragrant, about 30 seconds. Stir in the broth and water and bring the mixture to a simmer. Stir in the pasta and cook until slightly softened, about 5 minutes. Stir in the green beans until bright green but still crunchy, about 3 minutes. Add in the cannellini beans, zucchini, and tomato. Simmer until the pasta and vegetables are tender, about 3 more minutes. Season generously with salt and then pepper to taste. Serve, topping individual portions with a dollop of the pistou.